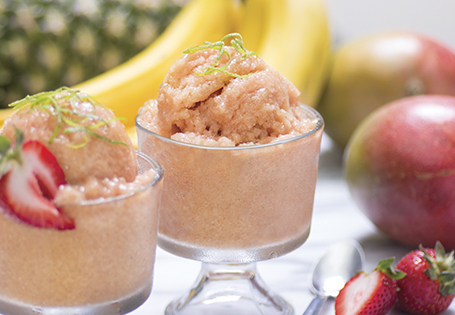 Made with only fruit, this dessert is sugar free and dairy free! Peel and dice pineapple, freeze for 1 hour. In a food processor, add pineapple, bananas, mango, strawberries and water. Blend until desired consistency; add more water if necessary. Top with lime zest and serve immediately.